We rode into town and parked our horses at a hitching post in front of the local Mongolian mall, called a black market around here. Luckily, these hitching posts are unmetered, so we left our horses without a fuss. A lot of local people rode into town as well; we didn't feel out of place. Horses are used for transport much more than vehicles. 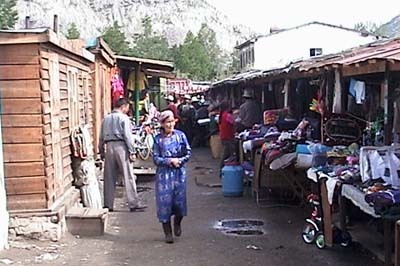 The black market is an array of informal little shops. Some shops are housed in large tin containers that look as though they should be attached to the back of a truck. We bargained for small items. I purchased 4 meters of orange silk to be worn around my waist as a tight sash, in the manner of Mongolian men (it helps hold internal organs together while being jounced on horseback). We also managed to find and rent a fishing pole since the fishing is reputedly fantastic. After shopping, we picked out our horses from the small herd tethered on the street, and rode for 30 km to our next campsite along a river. Unfortunately we discovered our fishing pole needed repair. Then I cast our backup handline into the river and lost it. That destroyed my credibility as one who "lives by the sea," as our Mongolian guide says (this is a landlocked country and therefore anyone who has seen the ocean is practically a sailor in our guide's estimation). Meanwhile, Jill proceeded to get lost on a stroll, so a rescue party left camp to find her. We're turning our guide's black hair into grey. Tsetserleg: A major Mongolian city and the last population center before we head out to the sparsely populated countryside. 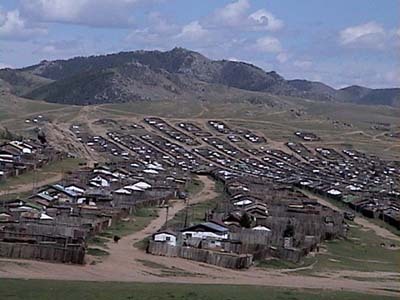 All of the Mongolian towns that we've seen look similar to this one - dirt roads, wood houses, tin roofs, and fences that show a strong Russian influence. We haven't figured out why the "city" Mongolians always fence in their small yards (unlike their countryside brethren that have no fences), but it is probably to keep livestock from roaming through the streets.